It had to happen. There was too much at stake. India’s new government had boldly stood by its predecessor’s decision to provide massive agricultural subsidies through the implementation of the National Food Security Act (NFSA), passed last year. On the other side, the US had decided to amplify its attempts to conclude the pending TPP negotiations, which would ensure the nation’s continued presence in the Asian market. India’s “defiant” act of pushing for food security had to come in direct conflict with the West’s inattention of becoming a dominant force in the area. The culmination of this friction was India’s decision to withdraw its support for the much-hyped Trade Facilitation Agreement (TFA) till a permanent solution could be reached with respect to the question of whether India’s subsidy regime is in violation of certain provisions of the Agreement on Agriculture. This prompted several academics to declare that its wrap-up time for the WTO. The story actually begins in Bali, where after serious efforts to negotiate a settlement regarding the NFSA, India received a temporary reprieve in the form of a Peace Clause. This peace clause or “due restraint” clause prohibited WTO-members from bringing litigation against India for its subsidies program for a period of 4 years (expiring in 2017). It was understood that in the intervening period, members would try and come up with a final solution to the problem, Even though the “Bali package” was considered a victory, it really was hollow one because not only did such a temporary measure presume that the NFSA was in violation of India’s WTO commitments but it also left the Act open for attack under other agreements like the SCM. Another curious fact that must be mentioned here is that a lot of people automatically infer our food security program is “trade-distortive” in nature. It’s one of those phrases that people love to throw around while discussing problems in the field of international economic law. But there is really nothing to show that the Act would have a negative, distortive effect on international trade. According to my understanding, the NFSA could only be considered to be trade distortive if the subsidised food items were to escape into international market at suppressed prices, thereby competing unfairly. However, the Act has made it clear that the aim of the program is providing food to the poor and that it is not export-centrerd. This should ideally be a sufficient guarantee to the international community. Finally, (and here’s where I think the entire problem lies) the temporary nature of the settlement proved to be its most fatal trait. This is possibly the only true “mistake” that can be attributed to India. The negotiators were naïve and felt that 4 years would be a sufficient time-period for India to come up with a comprehensive solution. Over time however, it was realized that certain Western powers would never agree to see India’s side of the story and that this may lead to the issue being left in suspended animation forever. It was only then that India realised that something had to be done on a more expedient basis. This brings us to the debate centered on TFA. As we know, the deadline for the same expired on 31st July and India decided to withhold its consent for the same. The stance taken was that, since an agreement on food security has not been reached (which directly relates to the human rights of people), India must principally abstain from an agreement concerning harmonising of international custom rules. Talks regarding the TFA will resume in September and the new government has made it absolutely clear that since it is not opposed to the TFA in principle, if the WTO membership were to agree to simultaneously address its concerns on food security, it would have no reservations whatsoever. One must note that food security and Trade Facilitation (not to forget the third development angle) were all equal parts of the Bali package. In that light, it makes absolute sense to discuss the two matters simultaneously and try to bring out a consensus regarding both. As far as the death of the multilateral trading system is concerned, I fail to see how India’s objection to the TFA is a step in that direction. India’s decision to prevent the passing of the TFA in no way shows that it is intent on derailing multilateral trade or is planning to promote regional trade instead. As mentioned earlier, India is not opposed to the TFA and has even incorporated certain aspects already (Ex: integrated border checkpoints). However, India must stand behind its stance that any form of trade (be it multilateral or regional) cannot possibly be given higher priority than basic human rights. This would be in line with one of the basic objectives of the WTO, which is to improve the living standards of people. India’s objection must be seen in this light.And in any case, Regionalism has , and probably will continue to be part of the international trading system. And one need not look any further than the GATT to understand that the treaty framers actually envisaged the possibility of regional trade existing in harmony with and addressed the same in Article XXIV. This is not the first, and definitely not the last time international trade will be pitted against other considerations like heath. In 2008, China and India walked out over the issue of protecting the poor when the issue was regarding Special Safeguard Mechanism. 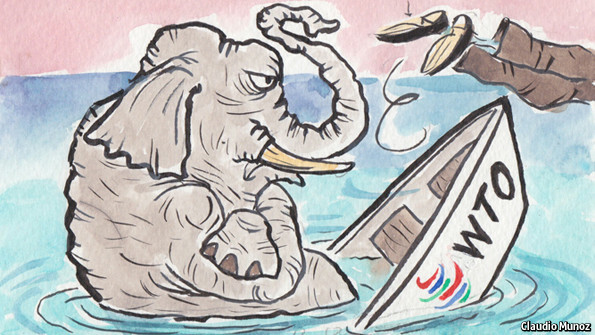 To put it crudely, the WTO has survived then and it will survive now. Thus, the amount of negative hype that this issue has created must be kept in check. It is also important to understand that this dispute is not as “India v/s the world” as is being portrayed. The underlying theme of developing nations (with their issues of food security) demanding equal berth from developed nations (with their export-centered TFA), must be appreciated. Considering that the Bali Ministerial Conference was an attempt to enforce the Doha developmental agenda, leeway must be given to India. Thus, India must make it clear that it is not standing in the way; only asking that a balance be struck..
Lastly, emphasis must be paid to the fact that before the timeline for the TFA elapsed, we did propose an alternate proposal and attempted to break the deadlock. This was again rejected by the Western nations. As long as we’re talking about India’s “image”, it becomes essential to break the notion that India’s decision was reckless, sudden and fanciful. Additionally, read about how the NASA is trying to help out our farmers here.